It is often asserted that ‘A Family that Prays Together, Stays Together’. But what if a child no longer wishes to pray? This book analyses the law in relation to situations where parents force their children to manifest the parental religion. From thorough examination of international law it argues that, unlike what is generally believed, the human rights regime does not grant parents a right to impose manifestations of their religion on their children. Instead, it proposes to regard coerced manifestations as a limitation on children’s right to freedom of manifestation, based on national laws that give parents rights at the domestic level under principles such as parental responsibility. The book focuses on two aspects of States’ positive obligations in this regard. First, the obligation to provide a regulatory framework that can protect children’s right to freedom of manifestation, and to restrict limitations to those that are proportionate or "necessary in a democratic society". Second, to provide access to remedies, which it is argued should consist of access to a family-friendly infrastructure for dispute resolution available to both parents and children in conflict over religious manifestation. Both depend heavily on the way States balance power between parents and children at the national level. 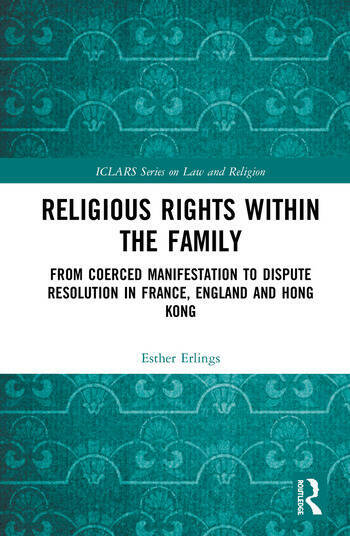 The book includes three case studies and social research of jurisdictions that offer different perspectives under the principles of parental authority (France), parental responsibility (England) and parental rights (Hong Kong). 2. A Parental Right to Impose Religious Manifestations? Esther Erlings is a Lecturer in Law at Flinders University (Australia). She has published in the areas of human rights (especially those of children), parental responsibility, and law and religion.